This is one of my entrée during the party. It's my first time doing it and it goes fine. I found the recipe at What's Cooking magazine. It really taste good and it good for the health. 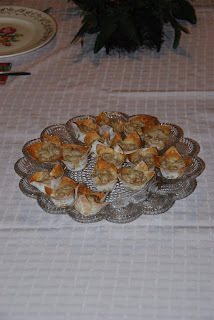 Preheat oven to 350 degree F. Mix crabmeat, cream cheese spread, onions and dressing. Spray 12 muffin cups with baking spray. Gently place 1 won ton wrapper in each cup, allowing edges of wrappers to extend above sides of cups. Fill evenly with crabmeat mixture. Bake 18-20 minutes or until edges are golden brown and filling is heated through. Serve warm. Garnish with chopped green onions if desired. Hi Carolyn, surely I add gyud tika, I love cooking and this site of yours make me wanna cook for more yummy foods. anyway thanks for letting me know. take care and have a great week. thanks for sharing the recipe. gusto naku ni i try one of these days.